Food doesn’t need to be complicated or difficult to make your mouth water. 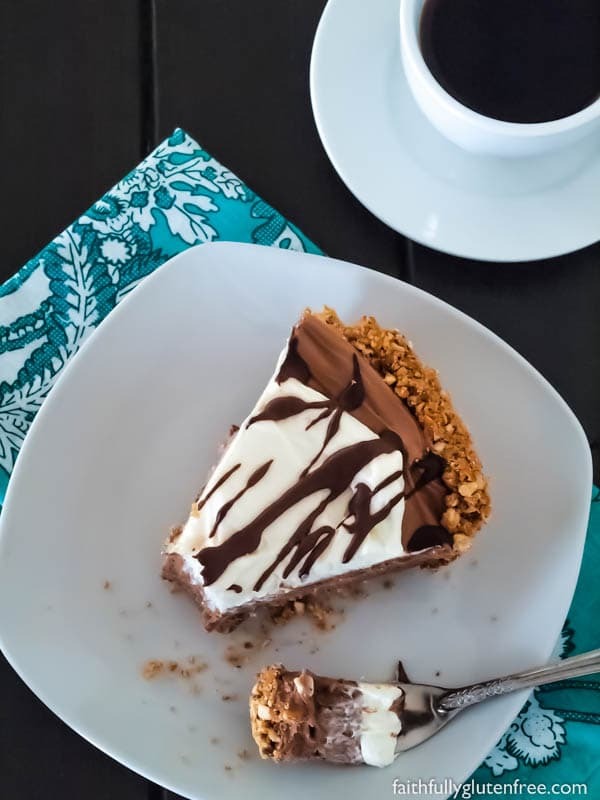 This smooth & silky No Bake Gluten Free Chocolate Cream Pie is the perfect example of that. This pie is so easy to prepare, requires only 7 ingredients, and you don’t have to turn on the stove to make it. Perfect, right? 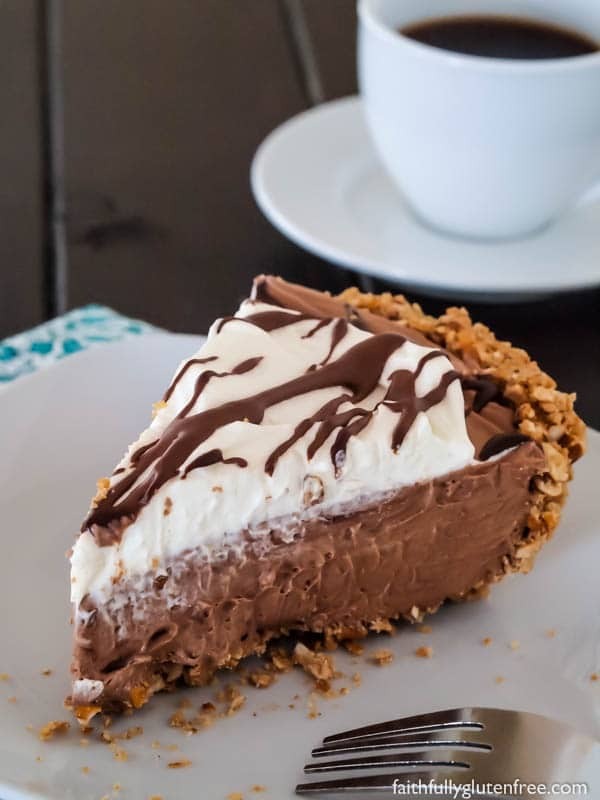 None of us wants to spend hours making a dessert, and you don’t have to with this easy, creamy no bake gluten free Chocolate Cream Pie. That’s my kind of math! I decided to add some cream cheese for richness, as well as stability, so that this pie would not have to be frozen in order to be enjoyed. But you know what? It would be absolutely delicious if it were frozen too! Just remove from the freezer 10 minutes before you want to serve it, and you’ll have a perfect melt-in-your-mouth decadent dessert. To make things even easier, I used gluten free pretzels for the crust. Confession time: I’m not really a fan of pie. That being said – I think it’s mostly because of the crust. But a pretzel crust is completely different than a traditional pie crust. Not only is it super easy to prepare, but it is also a nice crispy, salty crust, which pairs beautifully with sweet, decadent pie filling. 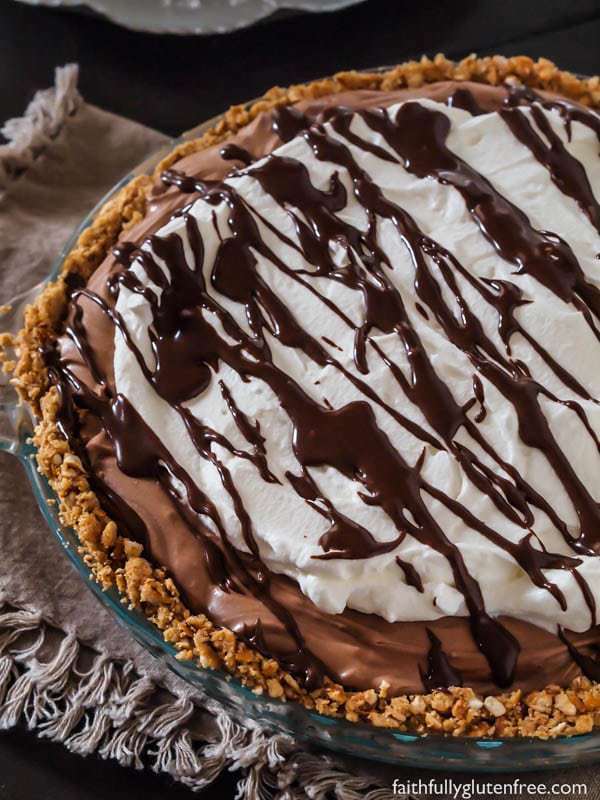 Serve the pie as is, or freeze it for a decadent chocolate dessert that only takes minutes to prepare. Mix the crushed pretzels, sugar, and melted butter until it is evenly blended. Firmly press the mixture into the bottom and up the sides of a lightly oiled pie plate (I used a 9 1/2-inch plate). Using the flat bottom of a cup or measuring cup helps ensure an even crust. Refrigerate the crust while preparing the filling. Use an electric mixer to beat the heavy whipping cream until stiff peaks form. Set aside. In a separate bowl, beat the cream cheese and melted chocolate until smooth. Add the sweetened condensed milk and beat until no lumps remain. Using a rubber scraper, stir about 1 cup of the whipped cream into the cream cheese mixture. Once that has been stirred in, fold in the remaining whipped cream. Pour the filling into the prepared pie crust and refrigerate for at least 4 hours before serving. The pie may also be frozen for a refreshing ice cream pie, just remove from the freezer 10 minutes before serving. I love this! It is so easy but looks so delicious! Pinned! Thanks, Elle! I hope you enjoy it! Could you use a tub of Cool Whip instead of the whipping cream? Hi Shirley, I’m sure you could sub it out. My husband is a “real whipped cream only” guy, so I never even tried. This looks amazing! I love that it’s no-bake – perfect for summer. This is my new favorite dessert! I had to omit the pretzels and I used a chocolate GF crust. And, it made so much filling I made 2 pies! Perfect right out of the fridge. Thank you so much for posting this. Going to try it tomorrow!!!! I live in india, so some of these ingredients might be replaced by whatever closest is available. Will let you know how it turns out!